Zion Market Research has published a new report titled “Recreational Vehicle Market by Motorized RVs (Type A, Type B, and Type C), by Towable RVs (Travel Trailer, Fifth Wheel Trailer, Folding Camping Trailers, Truck Campers, and Park Model), and by Application (Industrial, Commercial, and Residential): Global Industry Perspective, Comprehensive Analysis, and Forecast, 2017-2024’’. 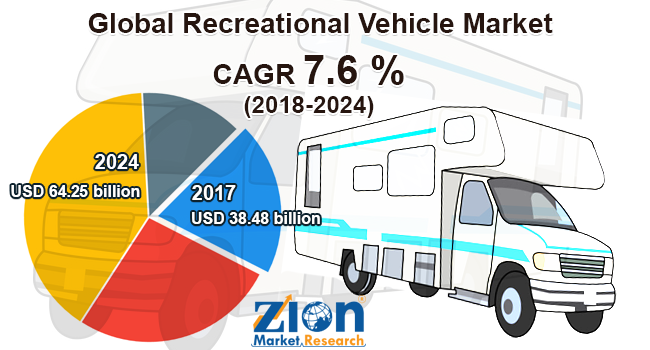 According to the report, the global recreational vehicles market was valued at around USD 38.48 billion in 2017 and is expected to reach approximately USD 64.25 billion by 2024, with a CAGR of 7.6 % between 2017 and 2024. Recreational vehicles are transportable living spaces to avail maximum luxury and comfort while traveling. They are also called motorized homes. They have excellent fuel efficiency and storage capability. New trends and ongoing innovations have transformed the conventional recreational vehicle market, as they are available in various lengths and sizes depending on per their storage capacity. Rising preferences for private mode of transportation with reference to mass transit coupled with continuously growing entertainment and comfort options in motorhomes is the major factor propelling the recreational vehicle market. Alternatively, government regulations for the use of RVs (recreational vehicles) in various regions are a serious factor that might limit the market. Nonetheless, advanced gadgets and innovative features can spur this market in the future. The global recreational vehicle market is classified into motorized RVs, towable RVs, and application. The motorized RVs segment is divided into type A, type B, and type C. The demand for motorized RV is growing at the highest rate, owing to a high degree of comfort and high fuel efficiency. Type A motorized RVs are the most expensive as they offer high comfort and luxury, whereas type Cs are less expensive motorized RVs combined with all the type A amenities. Type B dominates the motorized RV segment, due to their frequent use for camping. Travel trailer, fifth wheel trailer, folding camping trailers, truck campers, and park model comprise the towable RVs segment of the recreational vehicle market. The demand for travel trailers is expected to grow in the estimated time period, due to their wide applications and their use for long-term living. By application, the market is divided into industrial, commercial, and residential sectors. Geographically, the recreational vehicle market is classified into North America, Europe, Asia Pacific, Latin America, and the Middle East and Africa. The Asia Pacific holds the highest growth potential for the recreational vehicle market, due to a large number of initiatives taken by the government to develop the region’s tourism sector. Australia, China, Japan, and Korea are the major markets for recreational vehicles. Japan is a significant contributor to the recreational vehicle market in this region. Recreational vehicles are also used in Japan for commercial purposes. Japan imports a large number of RVs from the U.S., out of which 87% are towable homes. In 2011, during earthquake and tsunami, Japan imported a large number of trailer homes as temporary living spaces for survivors. However, some Asian countries have implemented driving and safety rules related to large vehicles that might hinder this regional market in the near future. Significant players of the global recreational vehicle market are Thor Industries, Inc., Gulf Stream Coach, Inc., Eclipse Recreational Vehicles, Inc., Coachmen Recreational Vehicle Company, Heartland Recreational Vehicles, LLC, Starcraft RV, Inc., Skyline Corporation, Monaco RV LLC, Jayco Inc., Fleetwood RV, Inc., Forest River, Inc., and Universal Trailer Corporation, among others.